Reflection: Maybe you have heard about this botched ‘restoration’ of a beloved painting in a Spanish church. The painting depicts the moment when Pontius Pilate said to the crowds in the mood for a crucifixion, Behold the Man! See John 19:5 Or as it is the Latin Vulgate: Ecce Homo. The Italian press are saying the painting should now be called, Ecce mono, Behold the monkey! The elderly woman who did this, had the permission of the parish priest and she said she had the best of intentions. Then we think we have trained Jesus to do our bidding for what we think are the solutions to our problems. But a solution is not the same as salvation. Then we end up with a distorted version of the Lord, as distorted as the erstwhile restoration above and we can only say, Ecce Mono, a trained monkey at that. There is an ancient tradition that The Apostles’ Creed was written by the Apostles and each wrote 1/12 of the Creed. This has no basis in historical fact, but on this Apostle’s day, it shows there is only one authorized version of the Lord Jesus Christ: His chosen apostolic witnesses, like Bartholomew (or Nathanael), accurately recorded in the inspired Four Gospels and the entire corpus of the New Testament. Nathanael began to give his confession, his apostolic witness: He is the Son of God, King of Israel. Yet, Jesus deepens Nathanael’s confession with the prophecy of Golgotha and the Resurrection: Heavens opened and the angels of God ascending and descending on the Son of Man. This refers to Jacob’s dream of a ladder with the angels of God ascending and descending on it. See: Genesis 28:11-13. Jacob called the spot Bethel, literally House of God. Jesus is the House of God (see John 2: 21). The Apostolic Witness is to the Incarnation and His Crucifixion and Resurrection. This witness, this Good News, for sinners was preached by the 12, clearly. When the Savior and His work is clearly taught and preached, according to the Bible, received and yes, eaten and drunk, by hungry and thirsty sinners (see Matthew 5:6) then the Holy Spirit is working faith in you. 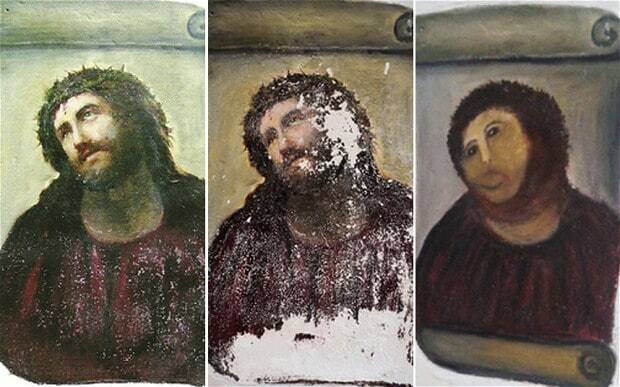 This is the clear picture of Ecce Homo and needs no restoration by the likes of me or even a theologian with 100 Phds. Do not trust any theology that deviates by invention and innovation the clear apostolic witness in the Bible. Almighty God, Your Son, Jesus Christ, chose Bartholomew to be an Apostle to preach the blessed Gospel. Grant that Your Church may love what he believed and preach what he taught; through Jesus Christ, our Lord, who lives and reigns with You and the Holy Spirit, one God, now and forever. Amen.